Auslandish Co. is equipped to collaborate and work with a wide variety of clients and collaborators! Fabric design, book covers, posters, album art, and custom illustrations are among current services offered. To learn more and find out how we can work together shoot Auslandish an email! Auslandish loves the environment and is taking action to be a company that operates more and more in an eco-conscious manner! We want to make it easier for you to do the same! In 2013, critically acclaimed Twin Cities restaurant The Corner Table commissioned visual artist Sarah Nelson to create a hand illustrated, custom wallpaper to compliment their distinguished and renowned dining experience. 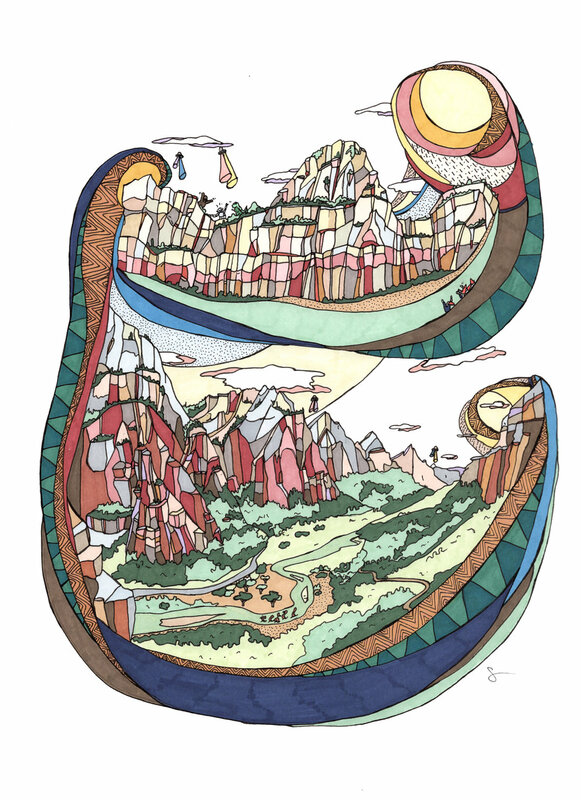 Using pen and ink, Sarah told stories from her life, mixed with whispers of classic Sci-Fi, surrounded by a frame of visually engaging shapes and patterns. She blended her Austrian upbringing with descriptive english words like 'Outsider', 'Outrageous', and 'Outlandish', and coined the term Auslandish. This initial commission was quickly followed by an original cover piece for the popular Minneapolis periodical, City Pages, and an Auslandish solo show that sold out in under twenty-four hours. Sarah Nelson started Auslandish Company in 2016. Auslandish Co. exists to serve as a platform for collaboration with other artisans, using hand drawn illustration, to preserve stories and memories in a unique and Auslandish way. In the online Auslandish Store, you can purchase prints and originals. Be sure to stay up to date with all things Auslandish by following along on your favorite social media platform!